Wow! Fettuccine Alfredo is on every menu in every Italian restaurant. What makes it seem so special is that everyone, including me seems to think it is so hard to prepare. While cream sauces tend to give that impression, the other night, I whipped this together after a hard day at work and in less than 30 minutes, to include preparing the noodles we were sitting enjoying this favorite Italian treat. Now every chef who prepares the sauce knows that everyone may be a critic, but like every region in Italy, Tomato sauce has a little different flair as well. So does this recipe. Boil water and cook pasta noodles until done. While noodles are cooking, heat butter and cream in a small sauce pan on low heat stirring frequently until well blended (do not let mixture boil). When butter and cream are blended, add grated cheese, parsley, salt, pepper and stir until well blended. Keep mixture warm on low heat. Pour a small amount of sauce in serving bowl. Drain noodles and add to the serving bowl. Pour remainder of sauce over noodles then gently toss to get the Alfredo sauce over all the noodles. Fettuccine Alfredo can also be served with chicken or broccoli. The basic Alfredo sauce can be used with many different vegetables as a side dish. Now you can use any type of pasta you desire but having regular fettuccine noodles is best. You can find already made noodles in the pasta isle of your local market and sometimes in the refrigerated section where fresh pasta is already packaged, but the best noodles are the ones you make yourself. Both Chris and John love the specialty noodles when there is no time to make fresh pasta using our hand powered pasta maker. Fresh made pasta is so gratifying and the taste is wonderful! If you were thinking of getting one locally, just be aware that they may only have a limited selection so you may pay more. However, you can search for a hand pasta maker in our link here. After clicking the link, type in "pasta maker" and you will find a selection to fit your budget. Once you taste your Fettuccine Alfredo with your fresh pasta you will never forget how good the taste is. 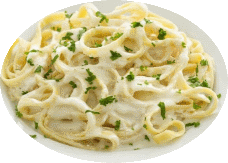 Return to Easy Everyday Cooking Recipes from Fettuccine Alfredo.